I was told Saturday I could probably get my car next to Dale Jarrets plane when he left Chicago after the race on Sunday, but I was also told very clearly that I had a 1 car limit for this. I'd been kicking the idea around for a year that this may be the easiest way to get the car signed, and it did work. We found out that getting near the NASCAR airplanes is pretty sacred ground, and we were the only fans allowed near the planes. This was the result of many phone calls, and some help from some people I knew in aviation operations in Northern Illinois. There was a crowd outside the airport FBO (basically an office), but no one else was allowed to go out by the planes. That is understandable in this day and age... But we got in! Anyway, we followed the airport manager out across the airport, and he let us park right behind Jarretts plane. This was an hour before the race even ended. 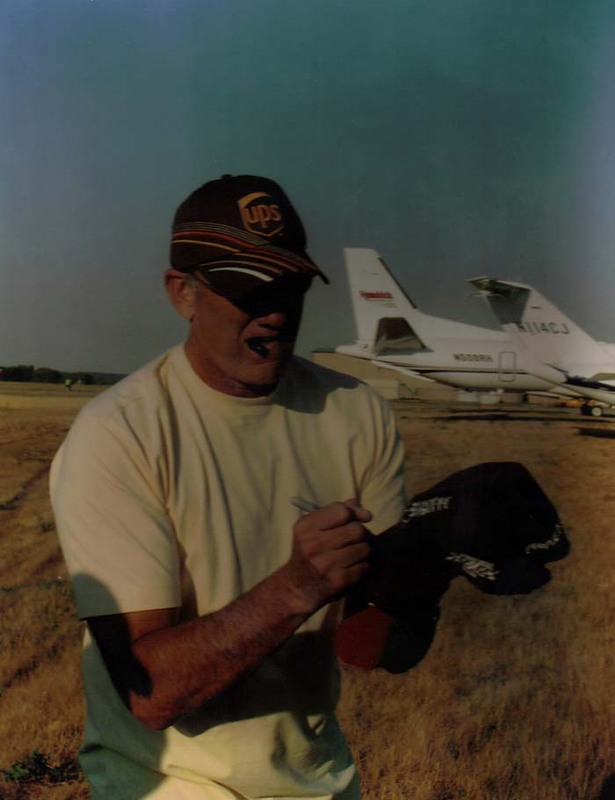 His plane was in a row of planes that had Rusty Wallace, Greg Biffle, Dale Jarrett, Matt Kenseth, Dale Jr., Jimmie Johnson, Mark Martin, Ray Everham, and one or two others. Plus there were other rows of planes out there. We did talk to Dale Jarretts pilot also to make sure this was OK, and to introduce ourselves. After the race ended, we started seeing some of the drivers flown in by helicopter. Michael Waltrip was there right away. Then we saw Jeff (and Ward) Burton, Kasey Kahne, Matt Kenseth, Greg Biffle, and Jimmie Johnson. We could have probably gone up to some of these guys to get autographs, but we did not want to push our luck. Most did say hi to us though. Then Rusty Wallace flew in, and he uses his own helicopter. He literally SPRINTED right to his plane, ran up the steps, and they closed the door instantly, and fired up his engines about 5 seconds later. These guys can be in a hurry, and I can see why. There were so many planes backing up, that several planes had to wait a half hour or more to take off. Just like ORD airport on a Thursday afternoon! Then Dale Jarrett came up. He tossed his bag on the plane, and came back to our car. We shook his hand, talked to him a bit, and then he got in the car and signed the dashboard. Then my 7 year old gave him a hat to sign. It was pretty cool overall. Pretty soon, most of the planes were gone, and Dale Jrs plane was the only one left on our row. We parked the car next to his plane for a few photos, and figured we would just wait for our chance to leave. We were on a grassy area between the runway and the tarmac, and there were planes moving everywhere. We knew it would be a long time for Dale Jr to show up, as he won the race. We were told it could be 5 hours or more of sponsor photos, press photos, interviews, and maybe a little partying! Pretty funny thing happened though. There was a guy sitting on the steps of Juniors Learjet, and we started chatting with him. He was nice, and easy to talk to. So my friend Danny just said "Gonna be here awhile, huh?" and the guy said "just for a bit". And we asked if he was the pilot, and he said no, he was just with the team. And Danny said "Well, good job on winning today", and the guy said "No, Junior won", and Danny said "isn't this Juniors' plane? ", and the guy said "No, this is Jimmie Johnsons plane"... (We had just seen Jimmie Johnson leave in his plane 10 minutes earlier), and Danny said "I swear this is juniors plane", and the guy said it was Jimmies plane. So Danny said "Are you sure, this has the JR Motorsports logo by the door" and the guy looked, and said "That's pretty funny" (Like he was being punk'd). And then Danny told the guy the tail number of the plane (obviously JRs plane... You can tell by the registration numbers most of the time. I work for the FAA, so I won't say what the numbers are, but you can tell). The guy got up, walked back to the tail, saw the number, looked around, and just shook his head. He said "Damn, I just missed my flight!". He then walked over to one of the commuter planes they had loading up to go home. Then we think we saw Mark Martin. A ramp security guy came up and asked if we wanted to stay, or go, as there was a break in traffic, and we could get our car across the ramp. We decided to go right then, as it would have probably been a few more hours for Junior to show up, and we really did not have that much time. We mainly came to get the car signed... And we did! It was a pretty cool afternoon getting to meet Dale Jarrett, and seeing the NASCAR Air Force in full stride. It was neat. Hopefully, we can get more Pace Cars signed in the future. This was not finalized until Saturday, and it was a rush to get it done. But now we know how to do it! It was sort of weird that my friend Danny was with me. He is a HUGE JR fan, and would have loved to meet Dale JR. I mean, WE WERE RIGHT BY HIS PLANE! But he won the race, and we could not wait that long because of babysitting issues. So we missed out on JR. It was probably the ONLY TIME Danny did not want JR to win a race. We got the car signed though, so it was still a great day. 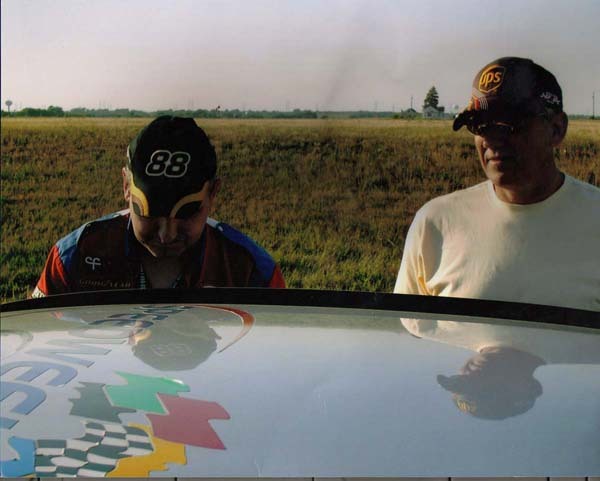 This is me and Dale Jarrett talking about the car and the 2000 Daytona 500. He was very tired from the race he just completed, but he did talk to us for a little while. Very COOL! He said he remembered the Pace Cars from the 2000 Daytona 500, and he always felt bad when a race ended under caution. He was really tired from the 400 mile race he just ran at Chicagoland Speedway. 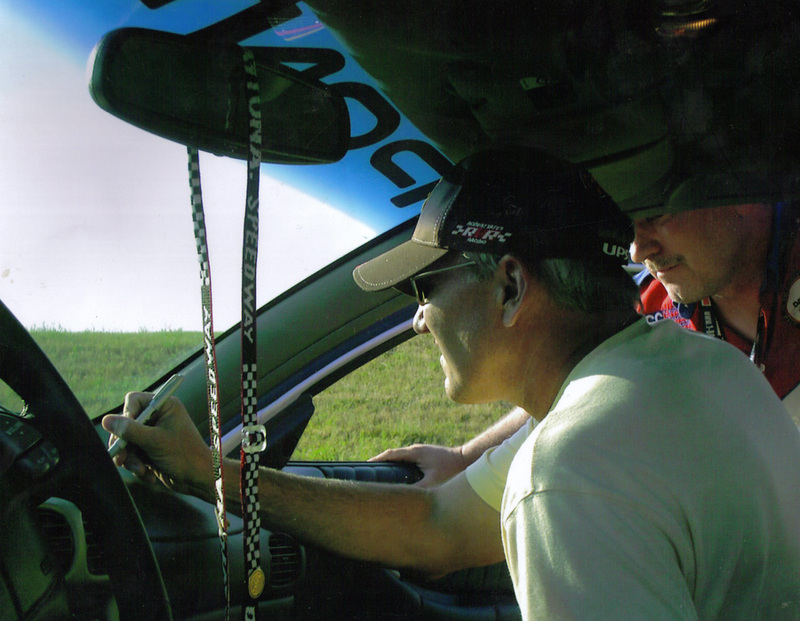 Dale Jarrett sitting inside the car signing the dash! This was a real honor. Not something you get a chance to do every day!